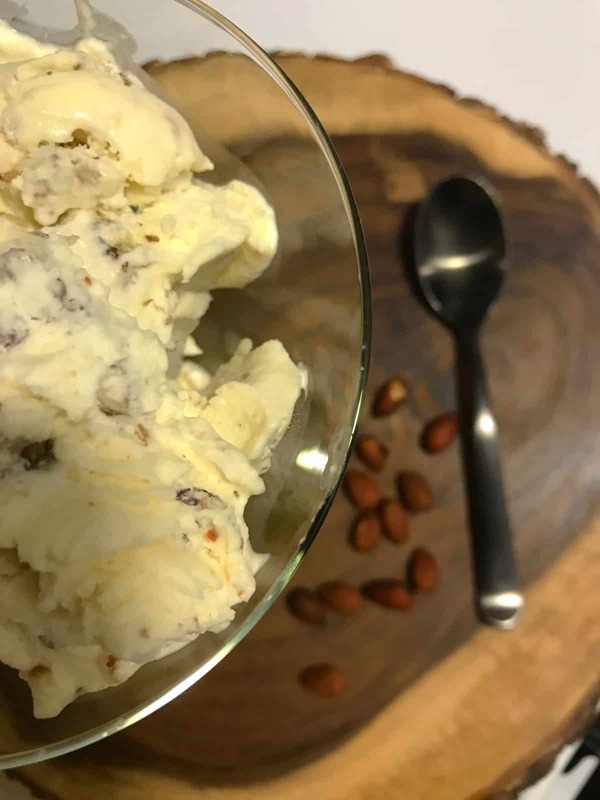 This Butter Pecan + Almond Ice Cream is fully homemade, requires no-churn, and has great tastes of nutty flavor in each scoop. The perfect sweet treat after any meal and is easily made using a handful of ingredients. Making my own ice cream was one of the many things I’ve set out to do for a long time and I’m so excited that I finally got a chance to do so! Funny thing is, I didn’t have to spend any money on a ice cream machine and it still came out really creamy and smooth like good ice cream would! Yes! A time-saver, money-saver, and taste-bud pleaser! It was super easy and only needed about 6 hours to fully set, although I made it the night prior before it was actually consumed (so it got a little extra time!). My husband and I actually tried doing it this past weekend (by substituting one of the main ingredients—heavy cream!) and it didn’t turn out great at all. It was hard on the outside and super “liquidy” on the inside. Yuck! Still, my husband ate a bit of it (i don’t know why! Haha!) and he said it was OK. Me on the other hand, I chose not to eat any and wanted a do-over so that I could perfect it. So I did just that and WALLAH! I got perfect ice cream that was so GOOD! Plus, you can make any flavor you choose along with using whatever toppings per usual with many of my recipes. That’s the awesome thing about being able to personalize your recipes. The above items are in bulk, but you can always purchase them individually on Amazon Fresh or your local supermarket if available (although I’ve only seen them at physical locations such as Target). Anyway, this was certainly a treat and I would recommend giving it a try! I think that I’ll definitely make my ice cream at home from now on, however, I’m not sure if I’ll fully give up eating Halo Top ice cream just yet! Haha! It’s a balance, Ya’ll! I’ll still buy ice cream on my lazy days I guess! Be sure to check out the recipe below. 1 can of sweetened condensed milk, 14 oz. In a medium size bowl, stir together the sweetened condensed milk, melted butter, pecans, roasted almonds, and brown sugar, until full incorporated. In the meantime, whip the heavy cream in an electric mixer until stiff peaks form. Fold the sweetened condensed milk mixture into the whipped cream and pour into a 9x5 loaf pan (OR small metal bowl) and freeze for 6 hours. To serve, remove from freezer and let sit for a couple of minutes to soften slightly and enjoy! Who said you couldn’t eat ice cream out of a martini glass right? Haha! Have you tried making your own ice cream? What is your favorite flavor that you can’t live without? Be sure to let me know down in the comments below!